Dok is an AIR application (consistent experience through all operating systems) that provides a UI for Adobe's ActionScript 3 and Flex reference. Its main purpose is to offer access to all classes properties in a simple and slick user interface. At first Dok was a proof-of-concept application for HTMLFixer (a class that converts HTML page source code into valid XML) but it became so useful it would have been a shame not to share! 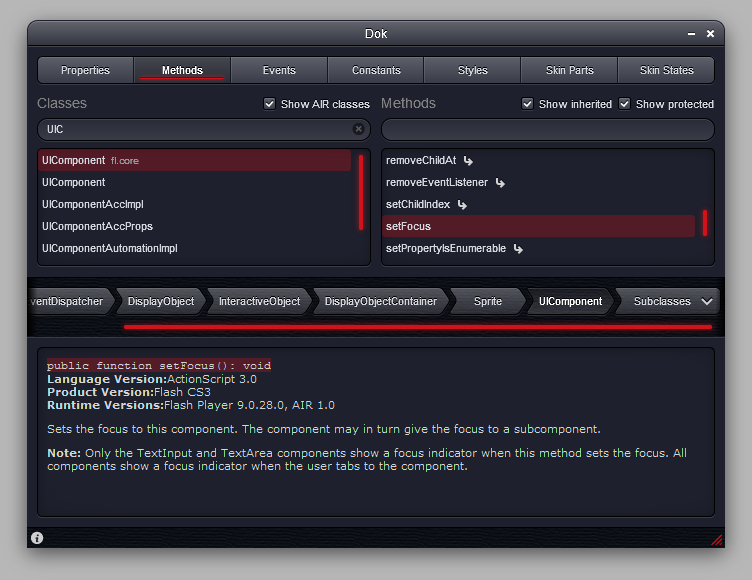 Everything in Dok is OpenSource, from code to theme ; including icons and all. Cool, huh? Fixed a bug when loading class details (Adobe changed the link logic). Improved the lists and exported the app with a signed certificate. Dok is an everything-OpenSource project by TOKI WOKI. All of its source is stored at Google Code, including HTMLFixer, SO (SharedObject utility class), App (application utility class) and more. Everything graphic was made with Adobe Illustrator and then chopped with Photoshop, see the "visual" directory for more details. Found a bug or have suggestions? Drop a comment on Dok's blog post. Dok, an AIR app by TOKI WOKI. Using it? Donate, homie.